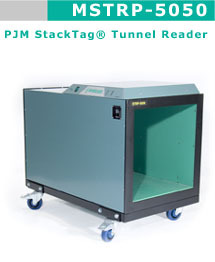 The Magellan PJM StackTag® Tunnel RFID Reader (MSTRP-5050) is designed primarily to work in tunnel and high speed belt conveyors and in situations where a large quantity of RFID tagged items in all orientations need to be identified quickly and reliably. The MSTRP-5050 PJM StackTag® Tunnel RFID Reader has an aperture of 500x500 mm and is a multi axis tunnel reader which switches the magnetic field rapidly between the three axes of X, Y and Z. The MSTRP-5050 will read and write to all PJM ItemTag® and StackTag® labels within the internal working volume of the tunnel despite the orientation of the tags. The RFID tags need to be of a size appropriate and matched to the tunnel RFID reader.